To understand how important mushrooms have been to the life of Joseph Marcantonio, D47, it is best to talk to his wife, Clara. She tells a story of a morning many years ago when they were riding home from church in their Sunday best, with her mind mostly on the new mink stole she was wearing. Suddenly, her husband brought the car to a halt. “Look over there!” he exclaimed. When she insisted that she couldn’t see anything, he pointed her toward a field filled with little button mushrooms, ones only a trained eye would be able to pick out from a moving vehicle. In a flash he was out of the car and on his knees. “Give me your stole!” he cried, clearly wanting it as a receptacle for the mushrooms. She protested that he would ruin the satin lining. “I’ll put them on the fur,” he said amicably. 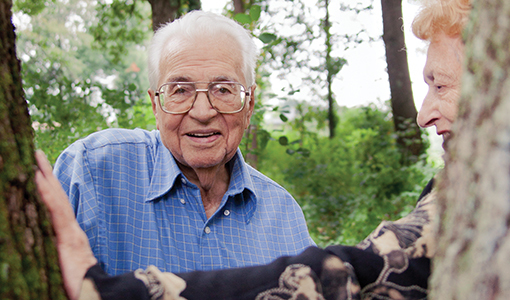 Long before foodies paid for the privilege of taking mushroom-hunting excursions, Marcantonio, age 92, was reveling in the virtues of wild fungi. He is well known in his stomping grounds of Walpole, Westwood and Norwood, Mass., for his uncanny ability to spot the often camouflaged delicacies. He has given lectures on mushrooms to local gardening and social clubs. Foraging was part of growing up in a tenement house in Boston’s North End in the 1920s. His family moved to Boston from Italy when he was 3, and soon after he was collecting clams, eels and periwinkles from underneath the pier; scavenging firewood from the buildings damaged in the Great Molasses Flood of 1919 and pinching bananas and oranges that “fell” off the carts at Haymarket. But his favorite part was the excursions that he and his neighbors—Italian, Polish, Japanese and German immigrants—would make outside the city to hunt mushrooms. Some would take their hats, knives and big baskets—woven specially to allow the dirt from just-plucked mushrooms to fall through—and head for the elevated train at North Station. Others would pay a dollar to the neighbor who had a car and go out as a gang. His father, Vincent, a farmer and winemaker back in Italy, was often the leader of the group. “They all followed him,” Marcantonio recalls. “He would go right to the places where the mushrooms were.” They called the place “lo bosco di Vincenzo” or “Vincent’s woods.” Sometimes, he and his father would turn this way and that, and eventually elude the rest of the group. “Zitto (quiet),” his father would whisper, bringing him to a secluded spot. “I can still close my eyes, and I can see the stumps with the beautiful mushrooms in bunches,” Marcantonio says. The younger Marcantonio learned early on that a mushroom hunter has to keep mum about his hunting grounds. When his cousins immigrated to Boston, his father showed them where to gather. His family would limit its choices to the six or seven varieties it knew were not poisonous. But some neighbors had other ways of testing. They would fry up the mushrooms with a silver dollar, and if the coin turned black, they would throw the dish out. Or they would eat a tiny bit, and if they got sick the next day, they knew not to eat it again. Long before foodies paid for the privilege of taking mushroom-hunting excursions, Marcantonio, D47, was reveling in the virtues of wild fungi. Marcantonio graduated from Boston College with a degree in physics in 1942 and took a job at MIT, where he did research on radar for the World War II effort. Not long after, he joined the Army (with his bad eyesight, he had to memorize every eye chart he could find to pass the physical) and simultaneously enrolled in Tufts School of Dental Medicine, becoming part of the medical/dental unit of the 26th Infantry “Yankee” Division. He re-enlisted twice, and remained in the Army Reserve another decade. In all, he served 26 years as an Army dentist, attaining the rank of colonel. But once he set up his dental practice, over a wallpaper company in Roslindale, he was back on the trail. He continued hunting when he moved his practice to West Roxbury and opened a second practice on Cape Cod, where he did a lot of golfing. But golfing excursions were often slow paced during mushroom season. On one outing, a group of women playing behind Marcantonio and his friends wondered why they kept leaving the course to go off into the trees. “What are you doing in there?” one of the women finally asked. On the other hand, sometimes you have to be nimble to hunt. Once, Marcantonio and his father dodged the flying balls on a driving range to collect mushrooms they spied there. His talent lies in not only being able to spot the mushrooms, but to know the kinds of places—a damaged hickory tree, a pile of leaves—where they might hide. “He knows what he is looking for, and he zooms in on it,” says his son-in-law, Vito Wasilunas. “I think he can smell them, too,” adds Clara. In fact, his sense might be too much of a good thing. More than once, his wife has come home to a bathtub filled with 50 pounds of mushrooms, all of which need to be rinsed three or four times. No one, she says, likes to clean mushrooms. He and Clara attended monthly meetings of the mycological society at Harvard, where they served some classic Italian recipes: mushrooms in tomato sauce; fried mushrooms with garlic and onions; mushroom salad in vinegar and oil and mushroom and veal cacciatore. But the high-brow mushroom aficionados Marcantonio met preferred to communicate in scientific terms, and although he has a well-thumbed field guide and several beautiful books on mushrooms, Marcantonio has never had the patience to memorize all the Latin names beyond some such as Armillaria mellea (honey mushroom) and Polyporus frondosus (hen of the wood). Julie Flaherty, a senior health sciences writer in Tufts Office of Publications, can be reached at julie.flaherty@tufts.edu.